This blog is derived from a previous class at Autodesk University based on Surface Finish and can be found at this link. Special thanks to Imco Tools for providing the cutters for this experiment. Also to Tormach and their PCNC 440, where all the testing was completed. All cutterpaths were made in Autodesk Fusion 360. Roughness - finely spaced surface irregularities. In engineering, this is usually meant by surface finish. Waviness - measures of surface irregularities larger than roughness; usually from deflection, warping, or vibrations. Measurement - Actual measurement of finish, either via contact or non-contact methods. When dealing with 3D contoured parts, and parts used in moldmaking, casting, patterns, etc. we often use a "street" definition of surface finish, how much time will be spent polishing parts. As all CNC milled parts will have some form of tooling marks left on them. When examining surface finish, you may often use some form of visual tool, such as the template shown below. This blog is going to focus on the CAM system; tolerances, stepovers, and toolpath styles. 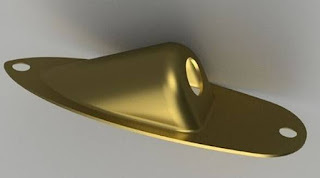 This blog will use a relatively simple 3D Contoured part, which is actually a cover for a jack connection for a Fender guitar. If you would like the file to practice with yourself, you can download the STEP file. When dealing with 3D contoured, you are dealing with faces. The cutterpaths created by the CAM system on the faces will be through many small straight line segments. These will be represented on your CNC mill as hundreds, and sometimes up to millions, of G01 point to point movements on your CNC machine. The chordal deviation is shown in the image below. The tighter the tolerance used, the more points that will be created during the CAM calculation. On our part, you can clearly see the difference in the picture below. The only difference in the two parts is the one on the left was milled with a very loose tolerance of 0.12mm (.0047") and the one on the right used a tolerance of 0.01mm (.0004"). Unfortunately, the scallop height calculation is only constant if the face is horizontal. When you have 3D contoured shapes and changing slopes, the scallop left behind actually changes, and often increases, as shown below, where the scallop on the right is actually higher than the one on the left, for the same stepover. Good surface finishes for 3D contoured parts generally require tight tolerances and smaller stepovers. Also, the milling strategy can have a great affect on the finished part. 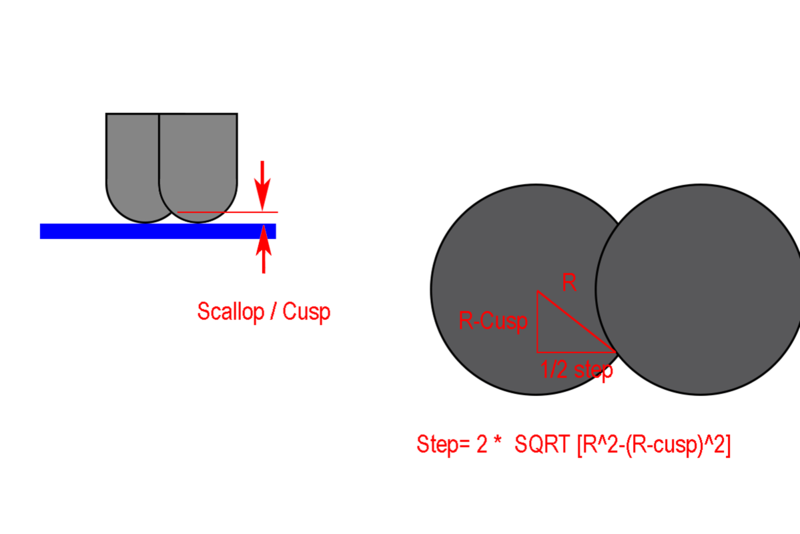 Common cutterpaths for finishing include a parallel planes strategy (sometimes called parallel or planar), some type of top to bottom strategy (usually called z-level finishing, or contour or water level finishing), and a constant scallop options (sometimes called equidistant or 3D scallop finishing). Other strategies like morph and spiral are also available and may be covered in future articles. They all have their advantages and disadvantages, and you choose the strategy based on the needs and part geometry. This cutterpath strategy uses slices in the X, Y or some angle in between. 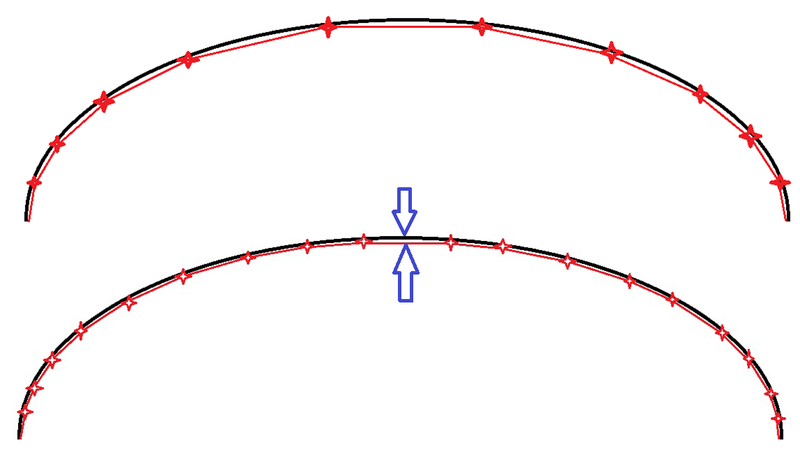 Fast to calculate, this can leave larger cusps when steeper surfaces are more or less parallel to the cut direction as shown in the images below. The left is a parallel cut in the "Y" direction, and the arrow shows where the cusp may be undesirably high. On the right is the cut in the "X" direction, which has the same issue, just in a different location. Utilizing a Z_Level finish is very popular in moldmaking, especially with hard materials. The tool starts at the top and works it's way down, rather than going back and forth and "bumping" into walls and features. However, depending on the geometry shape, you still can have large cusps let behind as shown below. Unlike the other two cutterpaths, this one does not utilize cutting by planes. The stepover is calculated in a 3D fashion, and the toolpath will keep making collapsing movements. This type of cutterpath will leave the same scallop or cusp everywhere, and usually have fewer retract movements in the process, all advantages. One disadvantage of this type of cutterpath are tool deflections and vibrations are in different directions all the time, as the tool is sometimes going uphill than downhill than around, etc. Also, the collapsing corners can often leave finish marks on the part, sometimes affectionately referred to as "snail tracks". Shown in the images below. Planar cutterpaths work great on relatively shallow parts, and Z-Level cutterpaths work well on relatively steep parts. 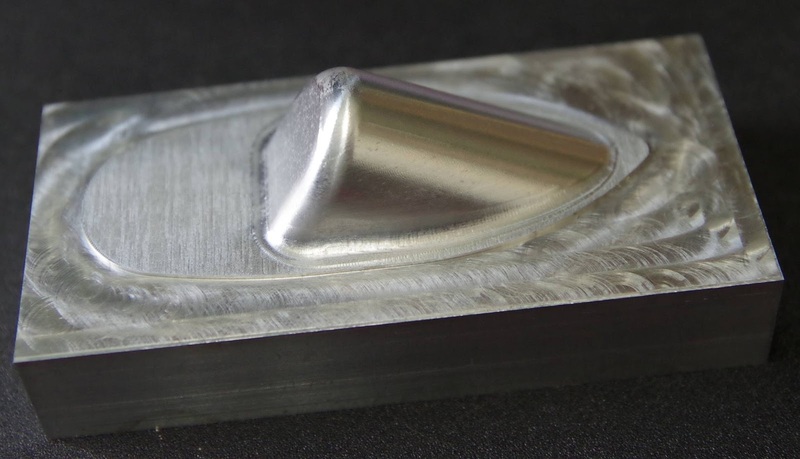 If you use the best of both of those on parts that have both shallow and steep parts, than you can get a great surface finish, and improved tool dynamics. That is the concept of slope based machining. If 0 degrees is horizontal, and 90 degrees is vertical, then you can limit cutterpaths to certain sloped areas. The image on the left uses a parallel strategy, but only for an angle of 0 to 45 degrees. The image on the right uses a Z-Level strategy, for an angle of 40 to 90 degrees, allowing for some overlap. This completely finishes the part, and leaves no large scallops or cusps to be concerned with. Lastly as a tip, we would generally recommend running a Pencil Trace operation prior to your finishing operation. This will pre-relieve the extra material int he corners, allowing for a smoother finishing experience. 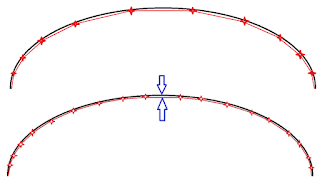 A pencil trace is where you run a tool in the corners of the part, at least the areas where the corner radius is about the same or smaller than the tool in question, shown below. The difference in your finished part is fewer tool vibrations or getting "pulled in" the corners when finishing. In the image below, the part on the left did not use a pencil trace before finishing, and the part on the right did. Note the marks in the corners. Even though it was a parallel finish, the marks are normal to the surfaces, showing the tool deflected at those locations. Use a tight tolerance and tight stepover for fine finishes, and match the cutterpath to your part, or use slope angles if appropriate. 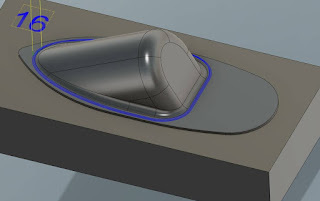 In the second part of this blog entry, we will look at how we milled the Autodesk Fusion 360 sample part, the reciprocating saw mold, on a Tormach PCNC 440, and got the desired finish as shown below. my website is mechanical Enginnering related and one of best site .i hope you are like my website .one vista and plzz checkout my site thank you, sir. 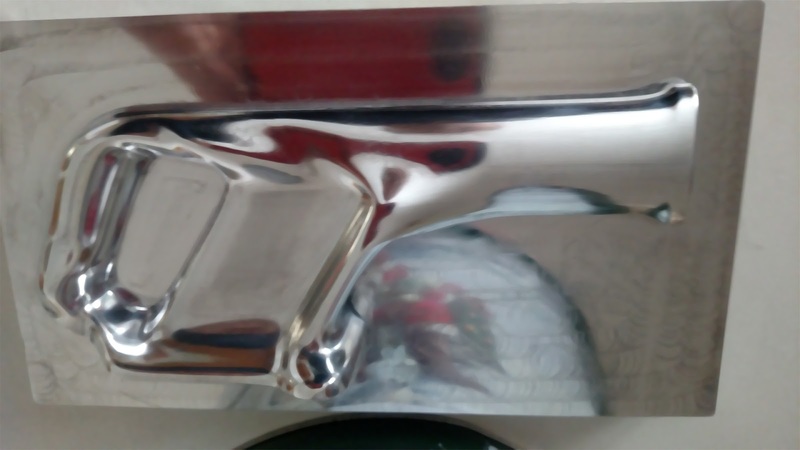 In this blog the author explains a clear view of CNC machines are used for surface finish. Thanks for sharing.